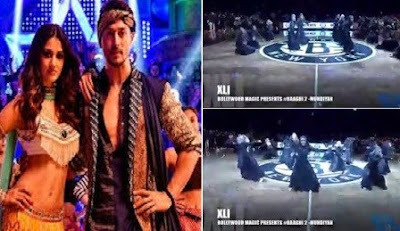 #TigerShroff and #DishaPatani starrer Baaghi 2, is not winning hearts in India but their hit and peppy number, “Munidyan” was the highlight of Net-Pistons Basketball game in New York. The cheerleaders and dancing squad performed on the hit number “Mundiyan” at Net Pistons game opening ceremony by BrooklyNettes. The actor Tiger Shroff, is excited about the song performance and express his excitement on the social media. Tiger Shroff and Disha Patani starrer Baaghi 2 has already entered the Rs 100 crore club. The Ahmed Khan directorial did not only have one of the highest opening weekends of 2018 with a collection of Rs 73.10 crore at the box office but it is also Tiger’s first film to enter the Rs 100 crore club. Next Tiger Shroff will be seen in Karan Johar helmed “Student Of The Year 2”.